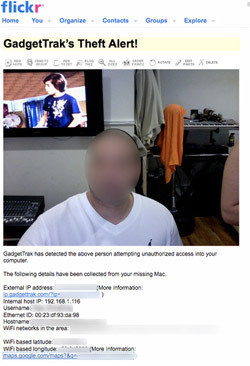 Look, GadgetTrak caught an evil iMac thief in Brooklyn! Years ago, I read an article in 2600 describing a system that would track down your stolen laptop. Presumably it was all open source software, I can’t remember. GadgetTrak, which is a company that can track down your stolen gadgets, including Mac/PC, iPhone, BlackBerry, and WinMo phone, has a fun success story that’ll kill a few minutes. An iMac was stolen in Brooklyn. Then the GadgetTrak software kicked in, taking a photo of the presumed thief and using Wi-Fi to pinpoint, to with a few meters. The police were then contacted, and paid a visit to the suspect’s place of business. There they found the stolen iMac, as well as two other stolen laptops. Seems to be a pretty convincing proof of concept. Not that I’m going to buy MacTrak anytime soon, mind you.